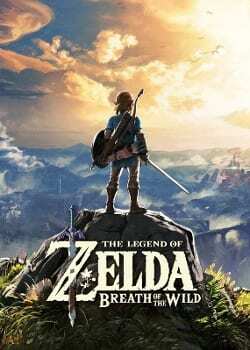 After much waiting with frustrating delays, Nintendo has finally released The Legend of Zelda: Breath of the Wild. Breath of the Wild is an interesting Zelda experience as it never feels like typical Zelda. It could have been an entirely different game that Nintendo executives saw and insisted get reskinned as Zelda. This is not a bad thing – Breath of the Wild is one of the most refreshing and game-changing entries in the Zelda franchise in a long time. The story begins with Link waking up in the “Shrine of Resurrection” with no memory of the past. He is informed that he has been asleep for one hundred years, and from here sets out with the goal to save Zelda from Calamity Ganon. Without going into spoilers, this is the basic narrative, with further points explored as you progress through the game. The amnesia element is one of Breath of the Wild’s most interesting narrative pulls. The game tasks you with finding your lost memories through simple story quests or the greater quest that explores the back story. Seeing small snippets of your past as presented by key characters in the game is fascinating. But this narrative feature ironically brings to light one of the biggest aggravations in Breath of the Wild. Nintendo has already shown portions of important moments in promotional material. If you have viewed any of this, then knowing what is to come may make these key moments lose some of the impact they otherwise would have had. Aside from the back story bits, which are satisfying if you have not watched any promos for the game, the overall story in Breath of the Wild is weak. From the moment the game begins, one can see the parts of the game the developers put their effort in to, and these are well done, but all at the expense of the narrative. 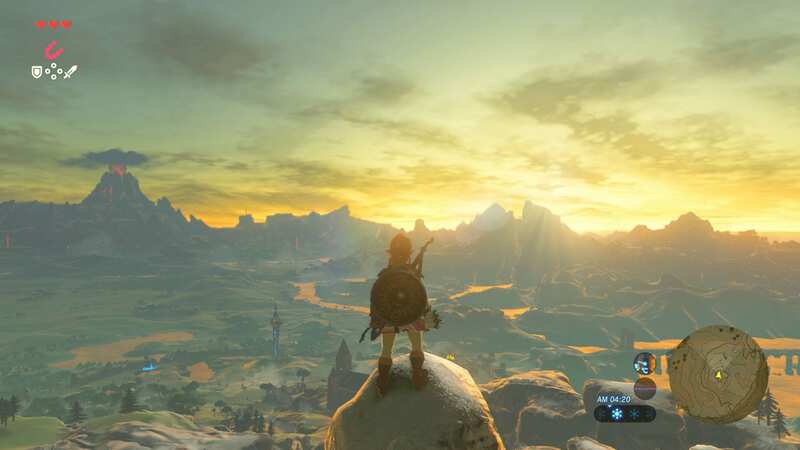 This demonstrates how far the Zelda franchise has come over the years – Nintendo now focuses on making a large, open-world – but it also shows that this different focus makes the story weaker than in prior entries. Much of the story feels empty, and story elements are missing that would have been interesting to explore. 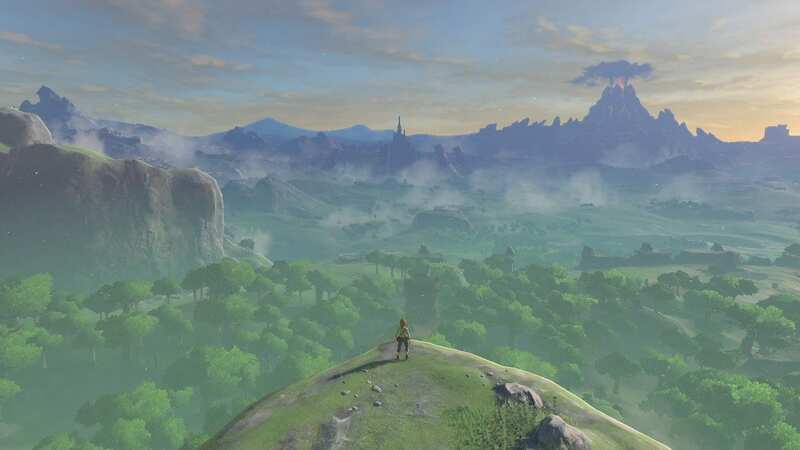 It is obvious that Nintendo’s focus with Breath of the Wild was on crafting an open-world. This Zelda entry harkens back to the original game – never since have players been given such freedom to explore in this franchise. You can focus on the main story, or go wherever you wish. It’s up to you. Despite this theoretical freedom, in practice you will learn that there must be some structure to your explorations. Some areas teem with stronger enemies against which you stand no chance early in the game, so you will want to stick to the easier areas. But whether you play it safe or flirt with danger, you will enjoy being able to frolic about in an open-world Zelda. Just be aware that if you tend towards danger, you will die. A lot. As in any open-world game, you can lose several hours to running around without clear direction. This constant adventuring is complemented by the games’ traversal mechanics. In the overworld, Link can scale any mountain, tree, or other incline. This means you can easily head to a higher point, and then gain a better perspective on where to go next. This adds to the open-world experience as you can climb more often and more easily than in similar games. This opens up a new dimension – you should not ignore steep areas that typically are just part of the background. 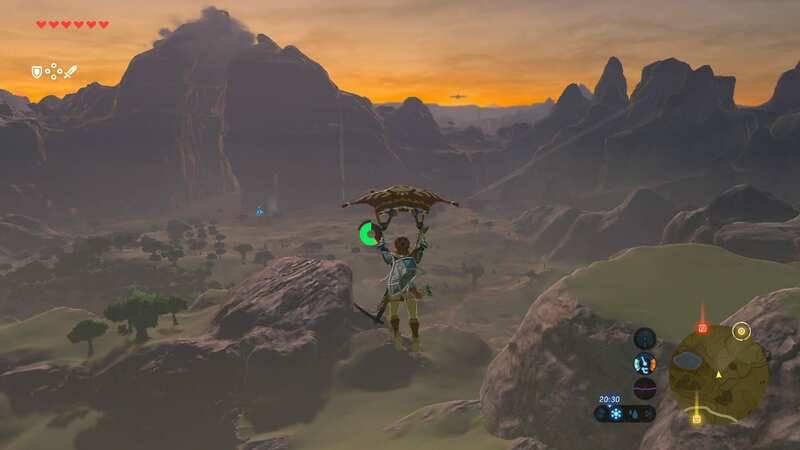 One of the games’ key items, the paraglider, can be used to soar across the skies (for as long as your stamina meter holds out). This, like climbing, makes travelling easier. After you climb a high mountain or hill and spot somewhere you want to explore, all you need do is simply glide down. Paragliding and climbing cater immediate satisfaction when eyeing new places that you want to check out. The variety in Hyrule’s landscape is enchanting. There are many different environments throughout Hyrule Kingdom: harsh deserts (best travelled by nightfall), cold mountains, and boiling hot surfaces. Discovering dark and foreboding forests, electrified plains, or open fields never allow for dull moments. 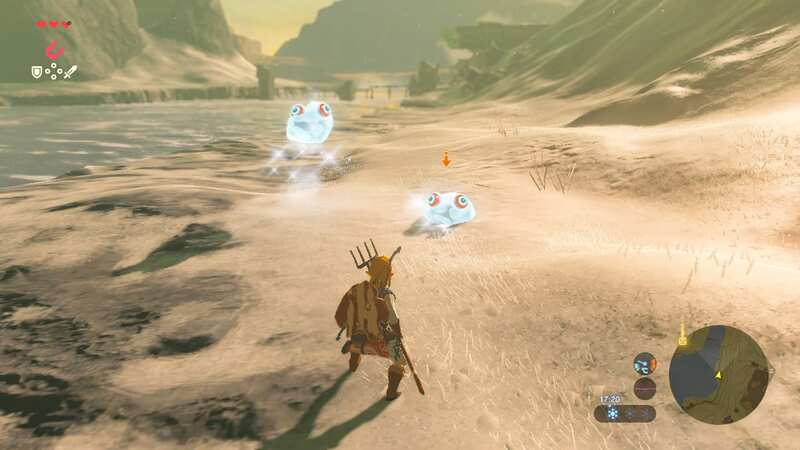 While traveling its large, diversified world, you will come upon one of Breath of the Wild‘s unique additions to the Zelda formula: Shrines, or mini dungeons. These Shrines offer classic Zelda problem solving that requires the use of different skills. In some Shrines you will face a small combat challenge, but in most you will encounter puzzles. In each puzzle Shrine you will learn a new ability for the obstacle you face. The abilities you gain in Shrines act as replacements for many of Link’s classic items. One of them allows you to use bombs that now come in two different shapes (a sphere and a cube) and are unlimited (but there is a recharge time between uses). Other powers are less traditional, like a magnetic power that allows you to move magnetized objects, and another that enables you to raise frozen pillars out of water. Each ability you acquire in a Shrine can be used in the greater game world. Mixing them up and utilizing them in innovative ways unlocks more of the games’ secrets. Combat in Breath of the Wild breaks from the usual Zelda experience. Unlike past Zelda titles, you pick up several weapons, each with different levels of durability and different strengths and weaknesses. Forget finding the one or two swords and riding them out – in Breath of the Wild, you will be picking up, using, breaking, and learning dozens of different weapons. Enemies will usually drop weapons, leading to a cycle: keep swapping out weapons until you find one you love, and then wield it until it breaks. Breath of the Wild adds stealth to the combat mix. You may sneak into enemy camps and steal their weapons, as well as silently kill them. There is also a dodge-and-parry system that requires perfectly-timed button presses to defend yourself or harm the enemy with greater effect. You can also use the environment by pushing rocks down cliffs to fall onto enemies. Clearly, the developers wanted to deepen the historically shallow Zelda combat formula. 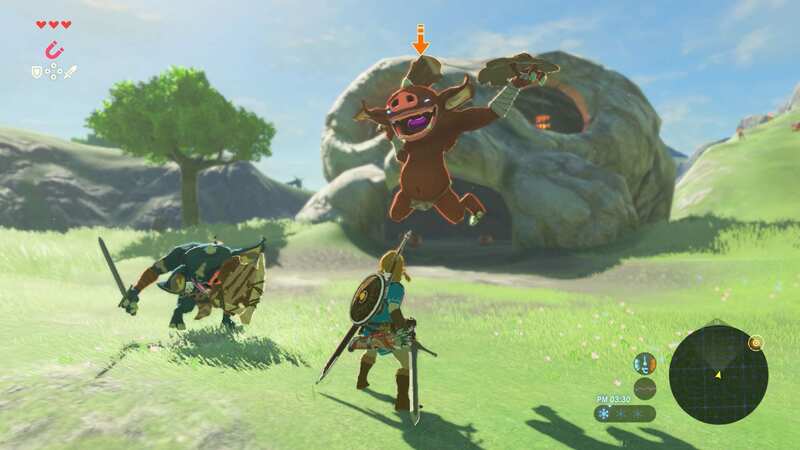 The game’s biggest change from past Zelda comes in its extensive inventory and health recovery system, which ties into its open world. Just about everything in the overworld can be collected and stored in your inventory. You pick up many food items to heal Link with and may also hunt wild animals for food. Cooking the food you find is important in Breath of the Wild. By mixing random materials together, you can create a plethora of different meals that offer varied health benefits. This adds a layer to the Zelda game beyond picking up hearts, which no longer appear. The Legend of Zelda: Breath of the Wild is a standout entry in Nintendo’s long running franchise. This is because many changes were made that broke from Zelda tradition. As a Zelda game it does not offer the same charm Nintendo put into past installments, but Breath of the Wild is still an incredible game. It needed a more satisfying overall story, but the open world and freedom to explore offer a truly unforgettable experience.